This mountain is located quite far from any convenient road. 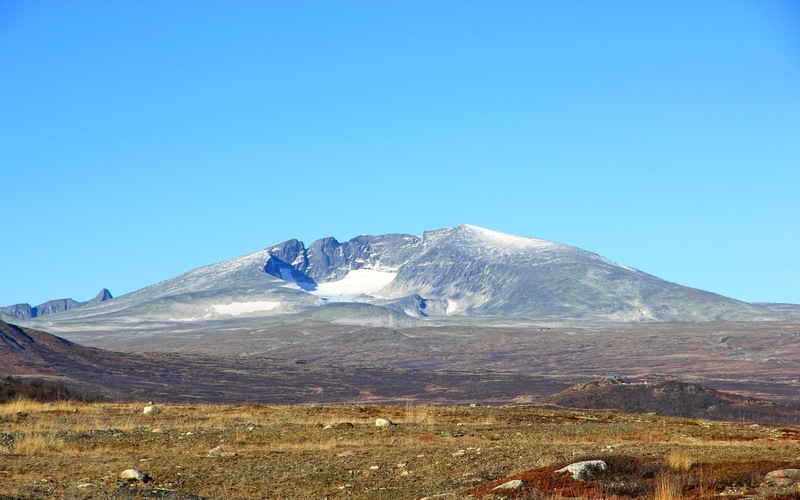 Dovre is a large mountain area and the best option is likely to plan this as a 2-3 day trip on foot or on skis, then use the opportunity to see and explore more than just the summit. 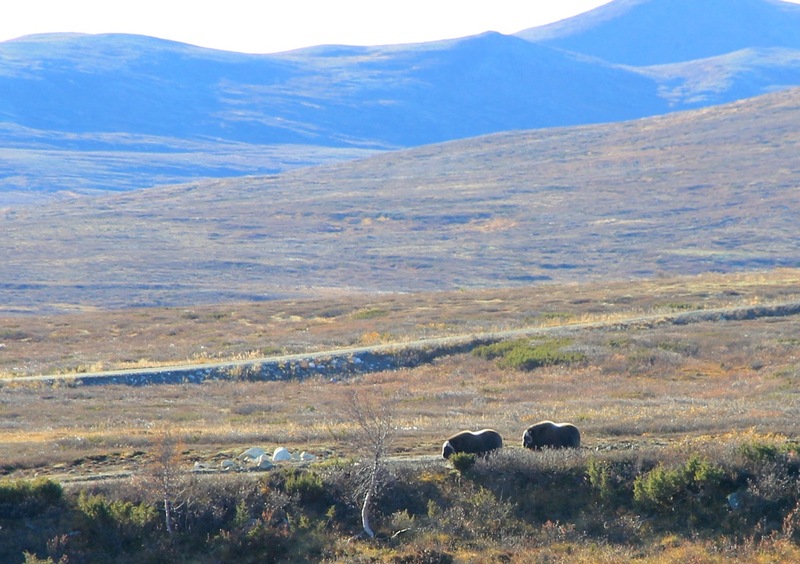 The shortest approach is from the south, travel a short distance west from Dombås, then north to Skamsdalen. This report will describe a hike from the main Hwy. E-6 running through the small village of Hjerkin. 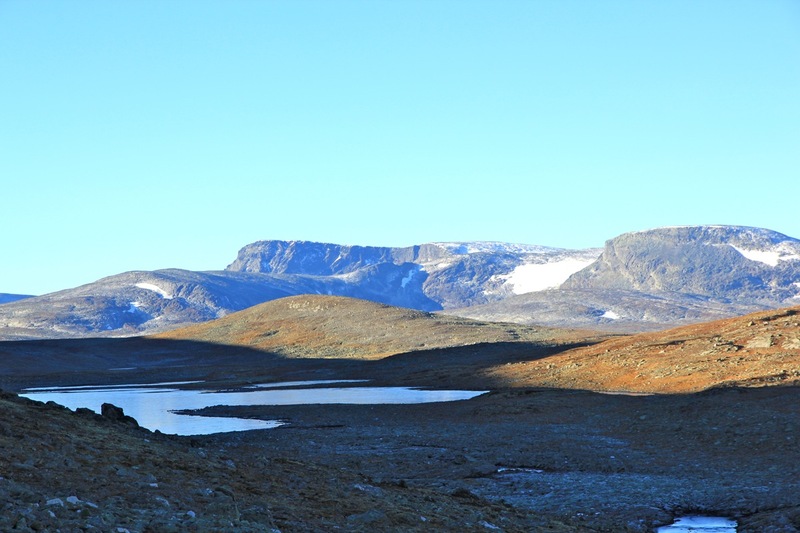 From Hjerkin, there is a road going 13 kilometer to Snøheim. Snøheim is now a full service DNT hut between mid July and early October. The military has operated a shooting range for heavy artillery in the past 50 years, but the area is now being cleaned up and converted to a national park. 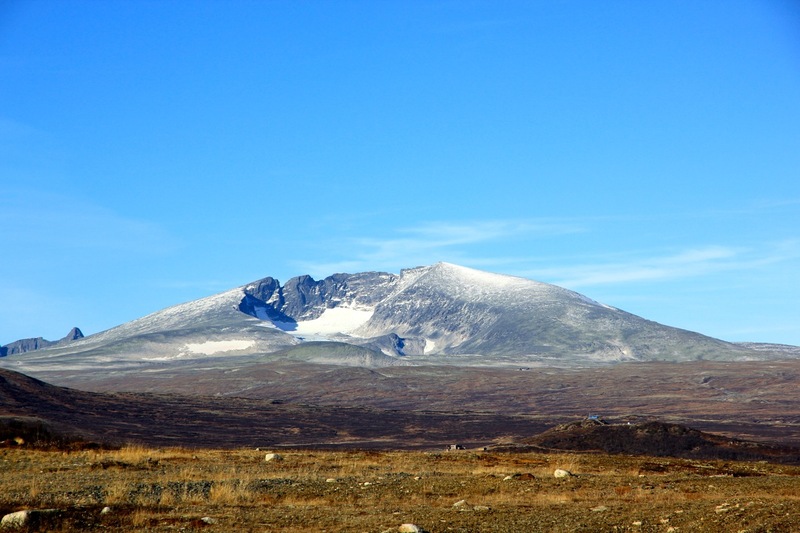 In 2013, a shuttle bus has taken people in/out to Snøheim, thus making the access to the big and dominating mountain Snøhetta much easier than in the past. This shuttle bus service ended the week before my visit, I parked at the gate, this location is at N62.22900, E009.52589, elevation about 1050 meter. This route is about 80 kilometer round trip, 25 kilometer of this is on the road that connects Hjerkin to Snøheim. This part was serviced by a shuttle bus in the period June 28 to October 6th. in 2013. Alternatively, one may bring a bicycle to be used on this road. From Snøheim, take the trail across to Reinheim, this is a self serve hut located in the upper part of Stroplsjødalen, a valley that can be walked from highway E-6 near Kongsvoll, a little north of Hjerkin. The next leg is from Reinheim to Åmotsdalen, another very nice self service hut. 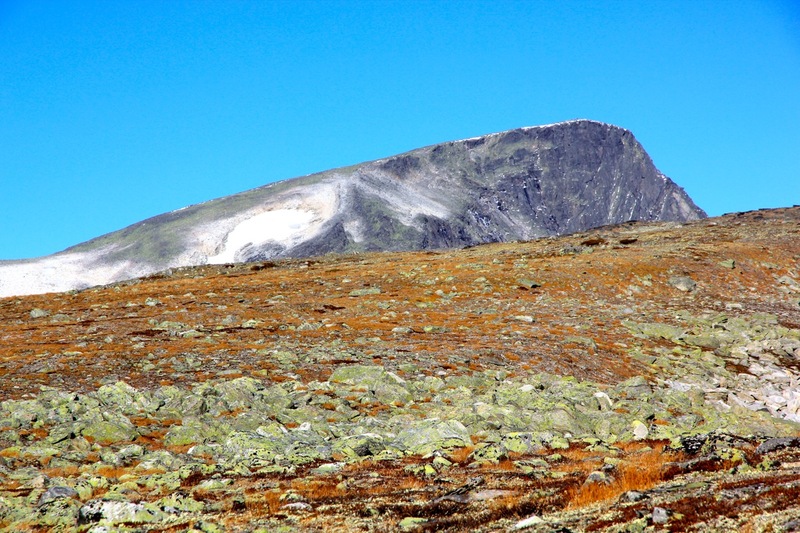 This route runs through Leirpullskardet, with a slightly shorter variation going across the higher ridge at elevation 1688 meter. From Åmotsdalen, proceed more south-west along the lake, then north of Midtkollen (1470m) and north of the lake Drugshøtjønnin. Immediately after crossing several small creeks there is a signed trail fork. 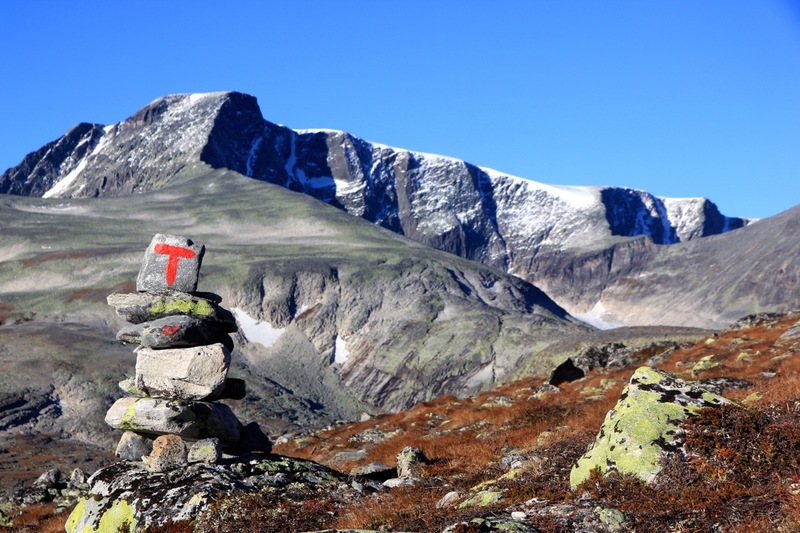 Leave the trail here and walk slightly north of west in order to cross between lakes 1406 and 1420 located at the base of Storskrymten. Finally, you now have the mountain in plain view. 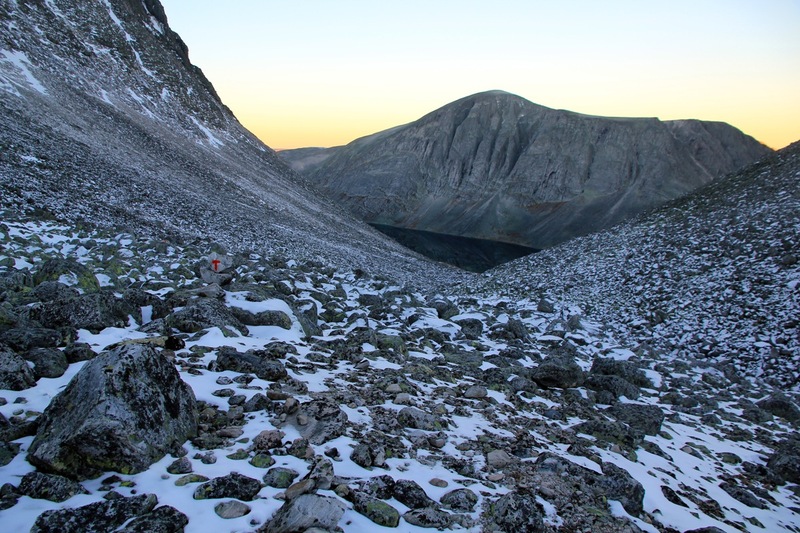 Ascend north (a small spur), then west to gain the main south ridge of Storskrymten. 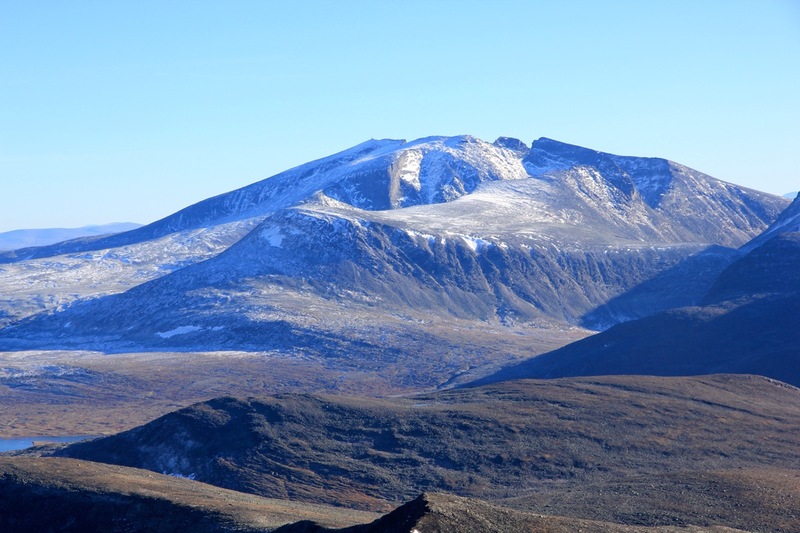 Next, follow this ridge to the final summit slope and continue uphill to reach the cairn. 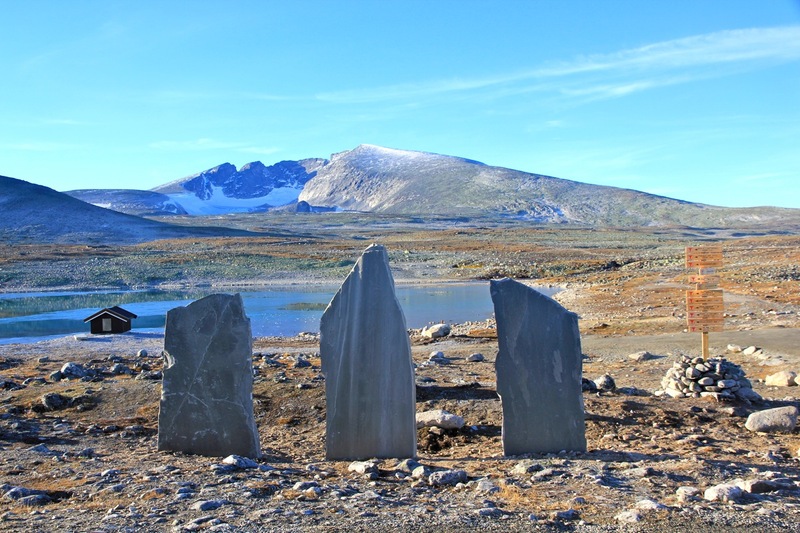 Return the same way, depending on the time an overnight stay at Åmotsdalen is recommended. 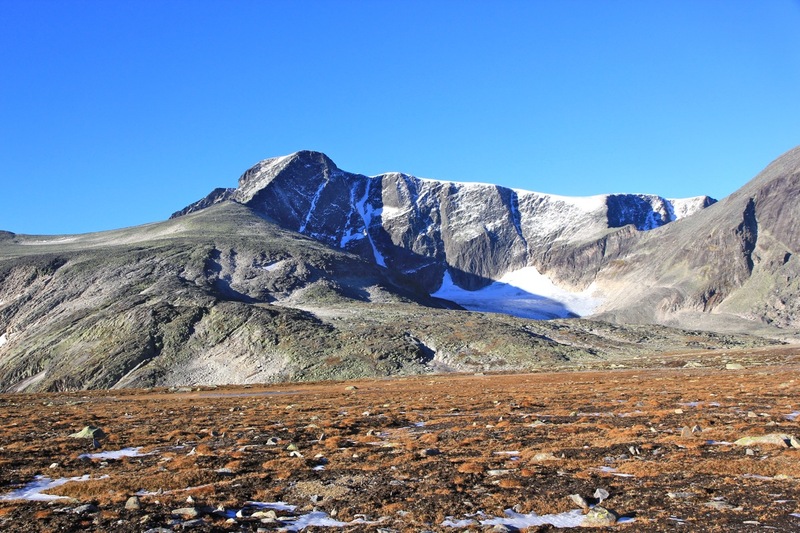 To make this trip a round trip, proceed south (right) in a signed trail fork about 2 kilometer (south-west) of the hut. (If you stay at the hut, you need to return back these 2 kilometer.) 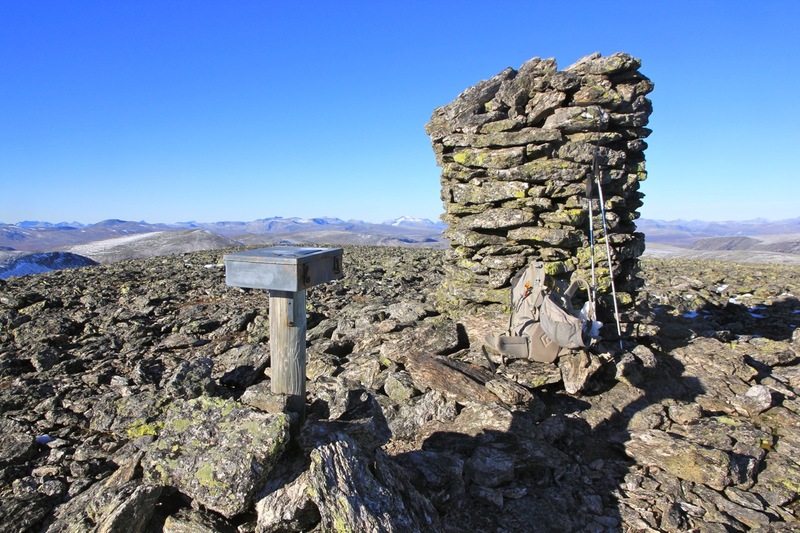 This trail will gradually ascend easy terrain to reach lake Langvatnet at elevation 1411 meter. 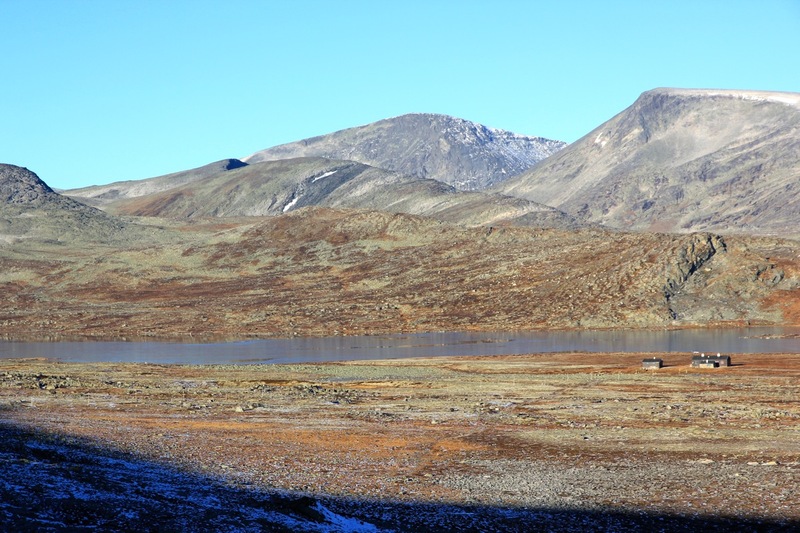 Near the north end of this lake, the route climbs more steeply between Store Langvasstinden (2046m) and Larstind (2065m) to reach lake 1642. The route now runs south near several more lakes, then more east back to Snøheim. 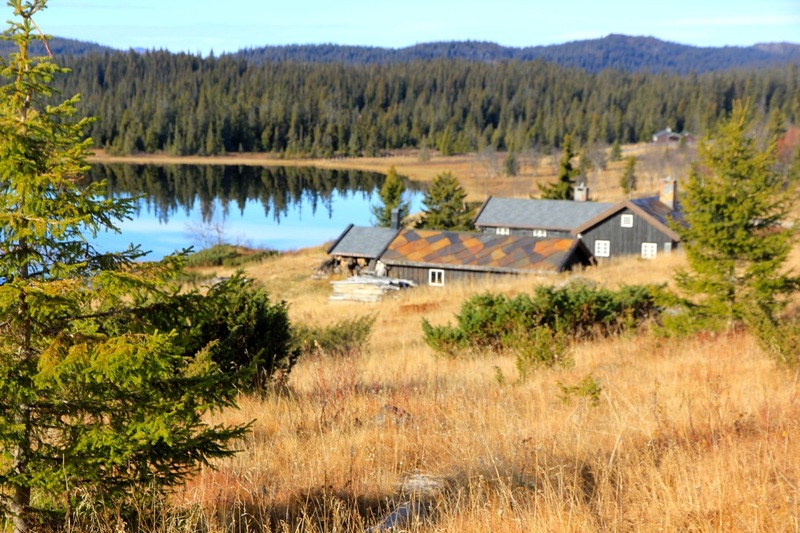 I had been doing some maintenance work on my mountain cabin near Lillehammer on Friday, next a conference on ICT in Trondheim would begin Tuesday morning. The forecast was exceptionally good - warm and sunny with no wind. 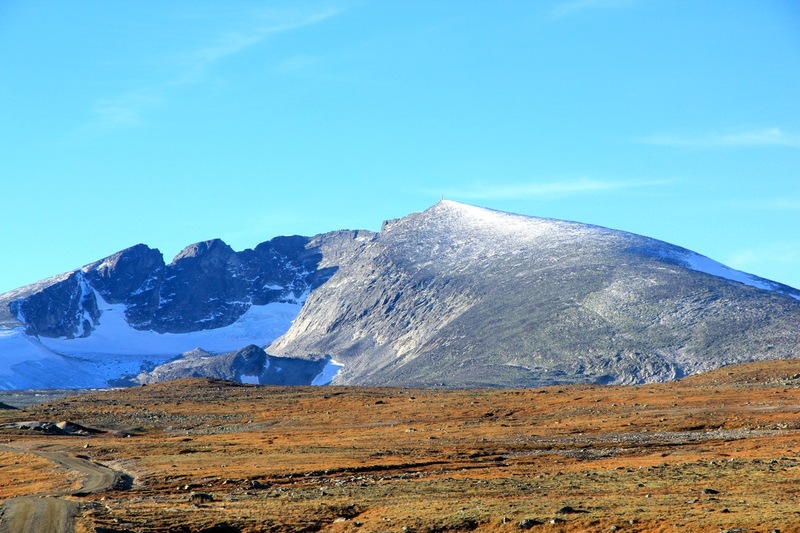 My original plan had been to visit 3 summits, all short day hikes, however, with the possibility of such great weather, I changed my mind and decided to do a major hike in the Dovrefjell mountains. 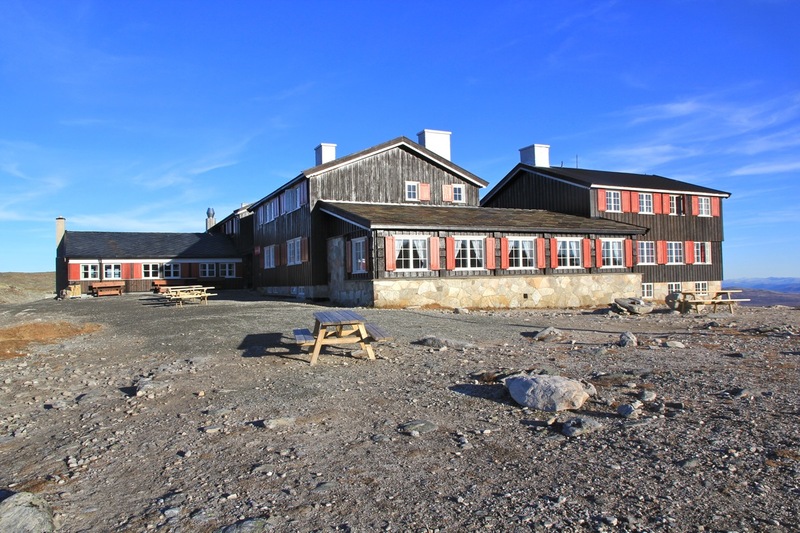 I had never been at the Snøheim hut and since this is now operated by DNT and the military is cleaning up their shooting range, I wanted to see if perhaps I could drive the road to Snøheim. No such luck, the road was closed and I parked at the small lot just outside the gate. Another party had just arrived. The young woman, Tonje Blomseth, was going to hike the road on foot and thus I had company for the first 13 kilometer. Tonje told me that she wanted to do mountaineering and outdoor trips/expeditions for a living and that she just had secured her first book contract with a publisher. 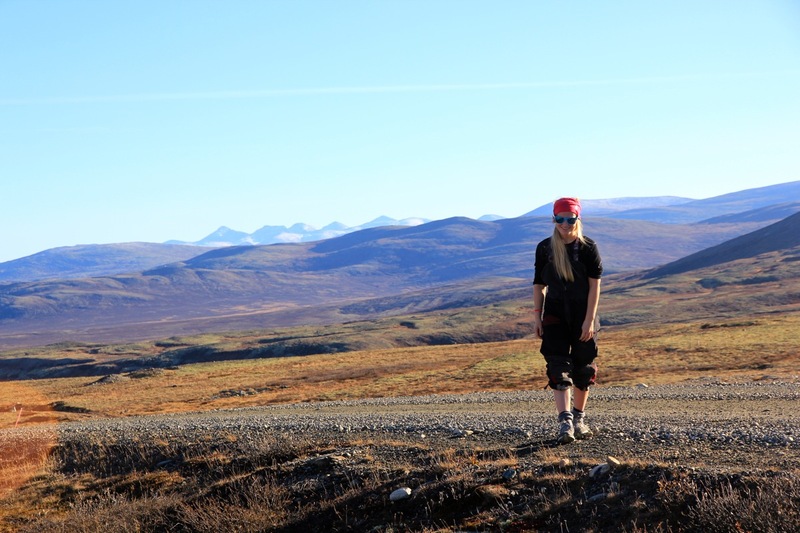 I asked if she was the young girl at 17 that had walked alone from the southern tip of Norway to the North Cape, NPL for short (Norge På Langs). She nodded and I told her I had read a few items on her blog from that trip. 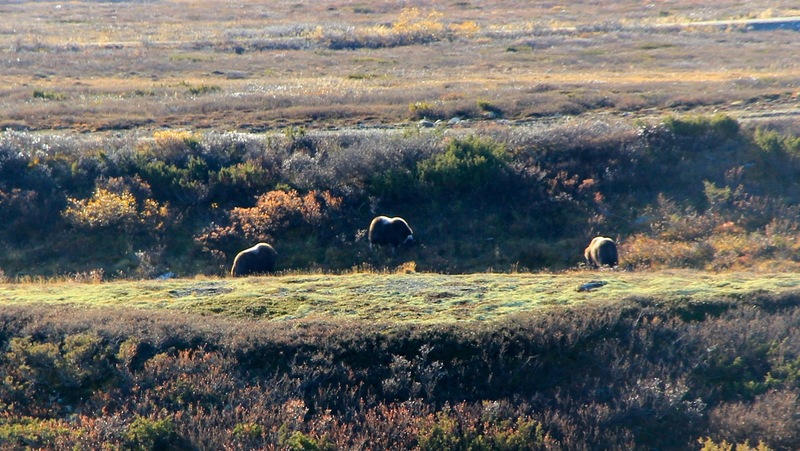 We left at 1300 and were lucky to see some muskox along the way. 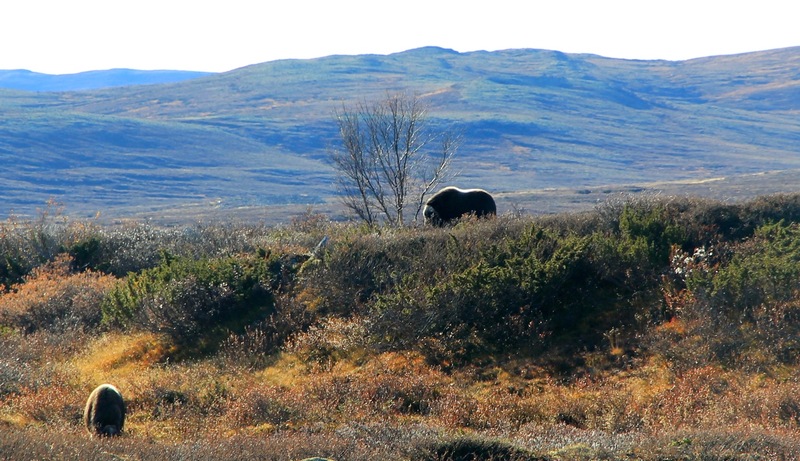 A few of these ancient looking animals were imported to Dovre from Greenland in 1931, they seem to thrive here at Dovre and number about 300 today. We arrived at Snøheim after 3 hours, - pretty good pace, at least Tonje seemed to be quite happy. 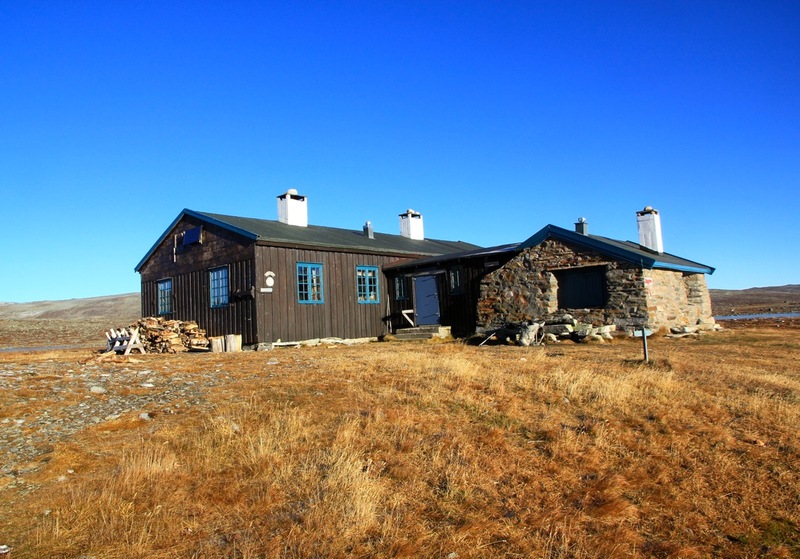 The hut had closed for the season, but hosted a special weekend program for the hut keepers of DNT - Oslo. I said goodbye and set out for Reinheim. This hike was nice with the evening light as I arrived at Reinheim by 1800. I left at 0715, it was barely light. Taking the trail to Åmotdalshytta, I had a good hike. Thinking about several trips in this area with my Dad in the early 1970s, he really loved this landscape. 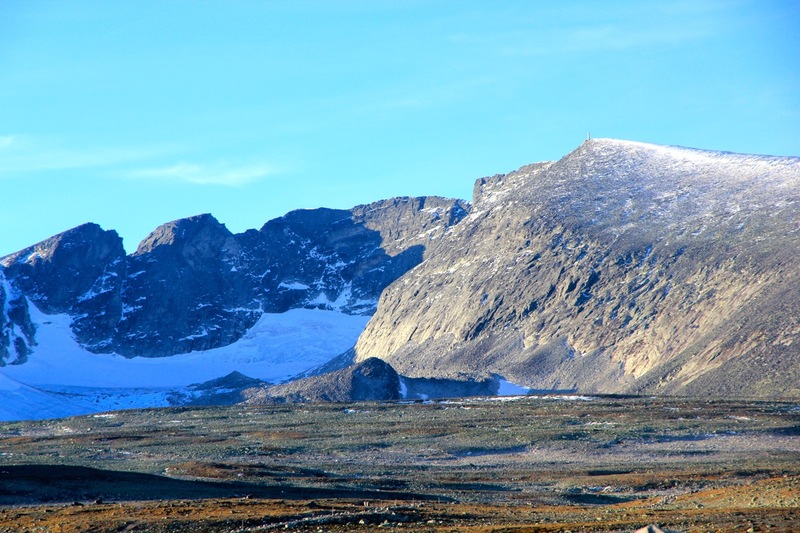 My goal, Storskrymten, was now visible, but I knew that my route could not be a direct line. It was a bit longer than I recalled, but finally I got to Åmotdalshytta slightly before 1000. Still a long way to go, I set out south-west along the trail following the lake. Finally, after 5 hours of hiking (and 5 more yesterday), I could now see the mountain across some nice and easy terrain. (this picture is in the opposite direction). 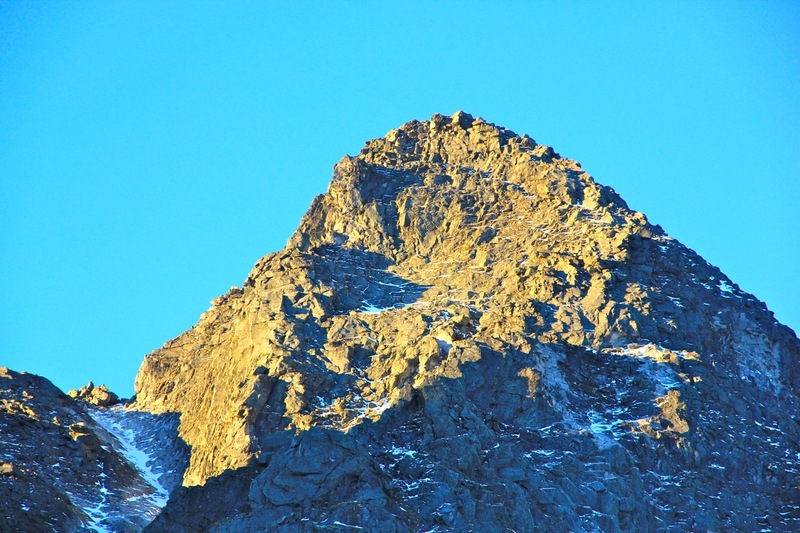 I crossed and ascended on easy slopes gaining the south ridge. From here, easy to the summit, arriving at 1400. It was a truely gorgeous day. I spent 45 minutes at the summit with great views all around. Snøhetta looks equally impressive from this side. I signed the summit register, one person had been here in the last month. I finally left and had a great walk back to Åmotdalshytta, arriving there at 1800. It was very obvious that getting back to my car today was unrealistic. 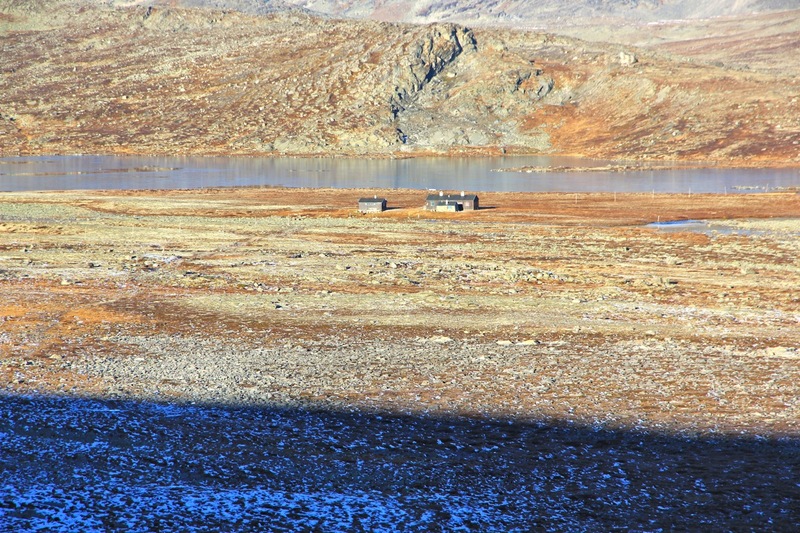 Instead, I enjoyed a nice evening at this very fine hut and took reindeer meet for dinner. Nobody around, in fact since leaving Snøheim I had only met two people that just left Åmotdalshytta as I arrived there earlier this morning. I decided to tidy up the hut before going to bed and leave tomorrow morning as soon as I woke up. Today, I started hiking at 0545. It was pitch dark with stars across the sky. The moon had set. My headlamp provided good light as I walked 2 kilometer back the trail I had arrived on yesterday. Daylight came as I negotiated the steeper part of the hill above Langvatnet. 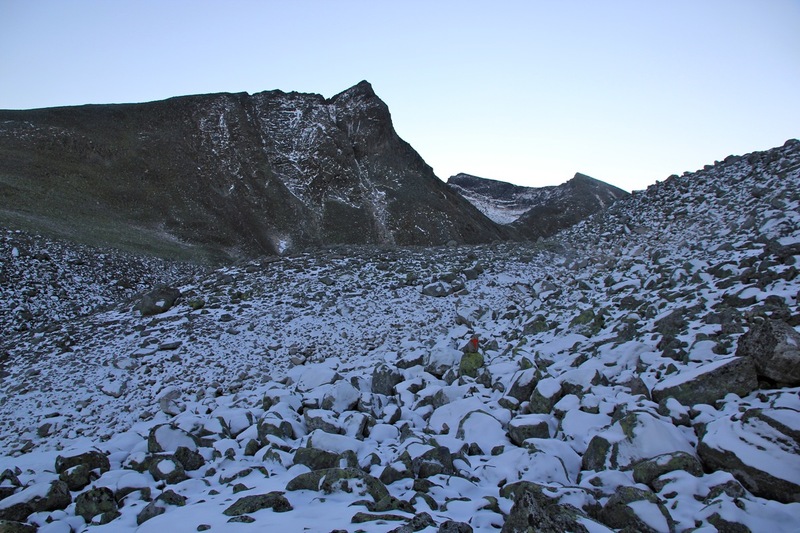 Facing north, all the boulders had (slippery) snow, in short the terrain here was cumbersome. Walking alone and without seeing anybody for almost 24 hours, some extra caution was appropriate. Thus my ascent was slow as daylight came and I could turn off my torch. I noticed many footprints left by reindeer higher up, closer to the first lake, they had come from the opposite direction. The day was just as nice as the two previous days. 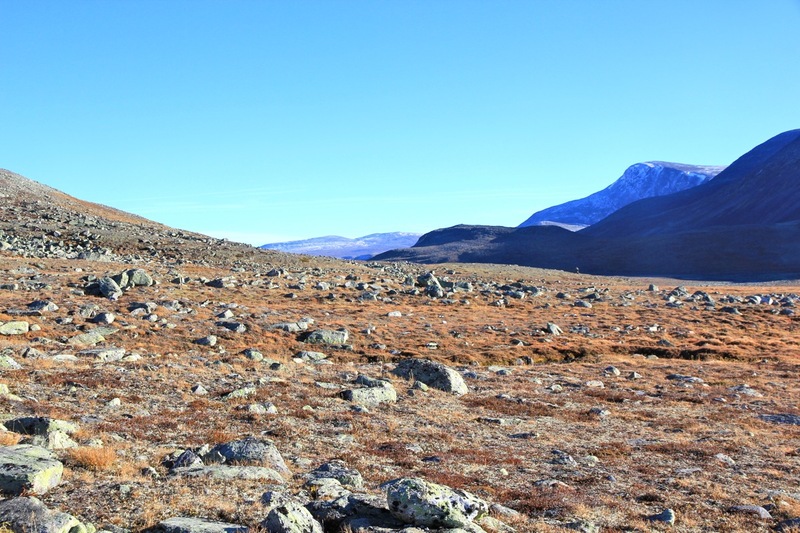 The landscape in this valley that cuts between Snøhetta and Svånåtindan, is pretty wild. Store Langvasstinden looks quite sharp, but also Larstinden has a nice profile. The trail back to Snøheim seemed longer than expected as I reached the hut after about 6 hours of hiking, After a short break, I began the 13 kilometer, gradual downhill road hike back to my car. However, after only 2-3 kilometer, I was overtaken by a truck. I put out my thumb and secured a ride back down the last 10 kilomter. To walk on such a road is efficient, but quite boring. 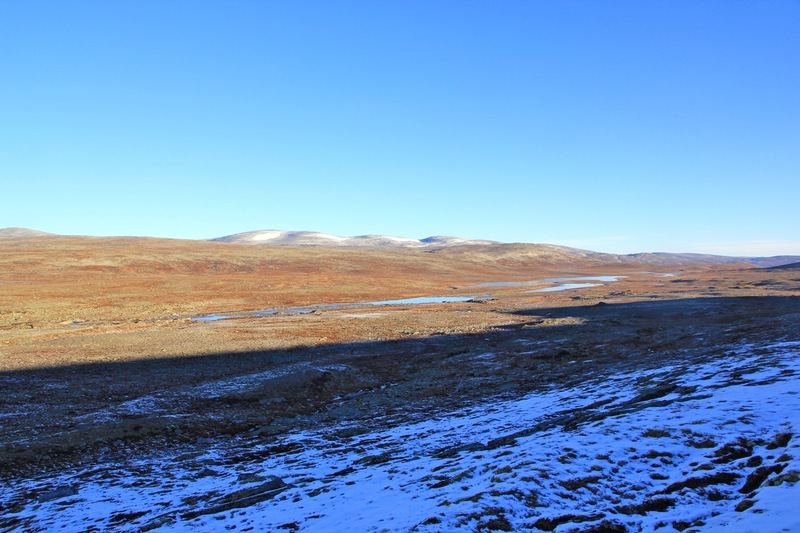 Thus, 3 very memorable and nice days in the Dovre mountains had come to an end. I like to dedicate this trip with all its good qualities to the memory of my father. Snøhetta up close, while hiking to Reinheim from Snøheim. 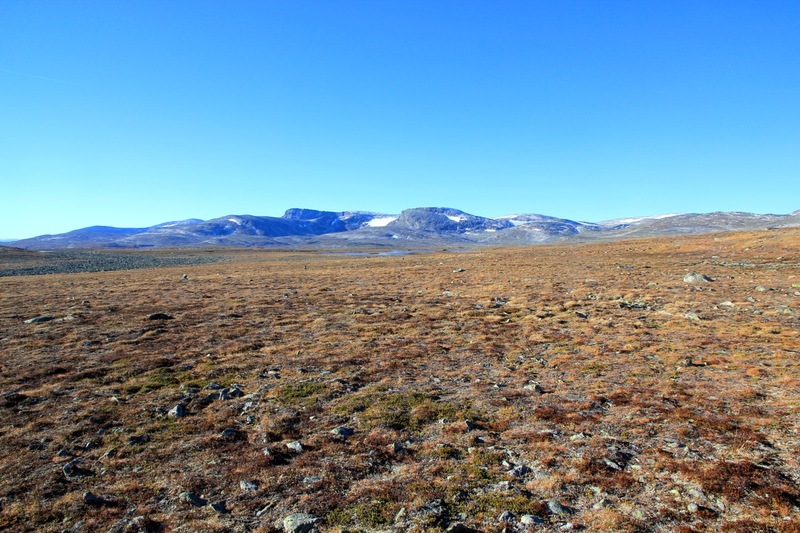 Mountain landscape, from the base of Storskrymten.